There is no need for extra equipment and setup in Giveanorder. NO INSTALLATION, NO EQUIPMENT!Giveanorder does not require installation and extra equipment. EASY USE - QUICK INTEGRATIONYou can start using in 15 minutes with easy admin panel. FULL CONTROLYou can easily reach your business from anywhere in the world. REASONABLE PRICESAffordable rates starting from $75. No maintenance fee. Installation is not required. With the online order module, you can easily follow your orders from mobile devices and reach the admin panel. No special device required. You can do all kinds of processing online from your tablet, computer or mobile phone. You can easily create your own site with your own Web Site Themes. By adding a menu, you can start to take orders. 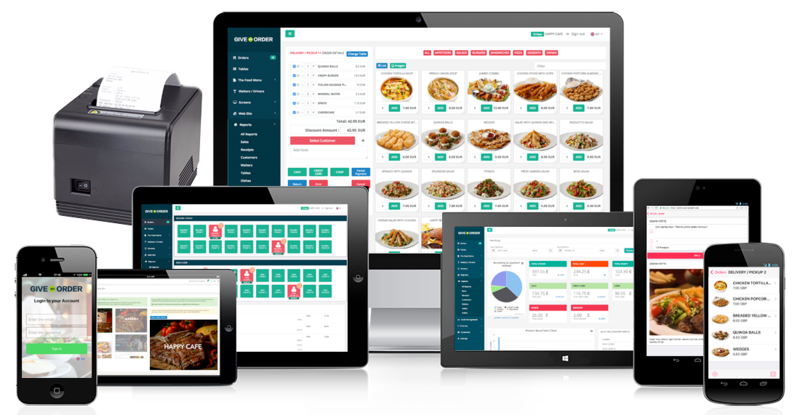 You can just start taking orders immediately by adding the menus and the tables in your business. You can follow all your orders from one screen. The execadminutive panel is very easy to use. With Give an Order, you can easily follow your debts and receivables, manage your income and expenses. You control the money in your business! You can easily access the inventory entries and follow-up of your products. Critical stock feature informs you about products that are decreasing in stock. You can define the raw materials used in your products (grams, pieces, etc.) while creating your meal prescription. You can control your products and stocks with prescription. From specially developed screens, business owners can follow orders, instantly access all the receipts , instant endorsement, sales charts according to products, waiter endorsement, table occupancy rates can be accessed anytime, anywhere. You can freeze your account at any time, and start using it again at any time. When you freeze your account and start using it again, you will not lose any information and you will be able to retrieve all your information again. With our web-based software, you automatically start to use all the improvements. This ensures that the system you use is always up to date, with all the new features. You can track your income / expense, order quantity, average revenue per order, personnel reports etc. at any time (including backwards). You can add customer specific requests and all details about the order in the note field. You can enter photos, descriptions and additional options for each product in your menu. You can easily split the payment. You can receive the payment either individually or separately. With GiveAnOrder, incorrectly payment calculation and the lost check problems will be over. GiveAnOrder calculates changes for you. With an infrastructure that is powerful enough to do all of this in a single system, Give an Order is easy to use and simple interface that allows you to adapt to the system for minutes without any training. Do you want special solutions for your business? You can start using in 15 minutes with easy admin panel.